Aspire SkyStar Revvo Kit consists of the SkyStar 210W box mod and 3.6ml Revvo Tank. The Aspire Revvo Tank features the ultra convenient top fill system and innovative ARC (Aspire Radial Coil) technology that easy to refill and bring the best taste. Attention: Shipping restriction: Due to exclusive distributor of Aspire, we do not send Aspire products to customers in Denmark、South Korea. Aspire SkyStar Revvo Kit consists of the SkyStar 210W box mod and 2/3.6ml Revvo Tank. The SkyStar Mod power by dual 18650 batteries that wattage can up to 210W. Featuring the friendly 1.3inch OLED touch screen, the continuous fire time can adjust from 5-15 seconds and convenient to switch multiple modes. There is multiple protection for safety. 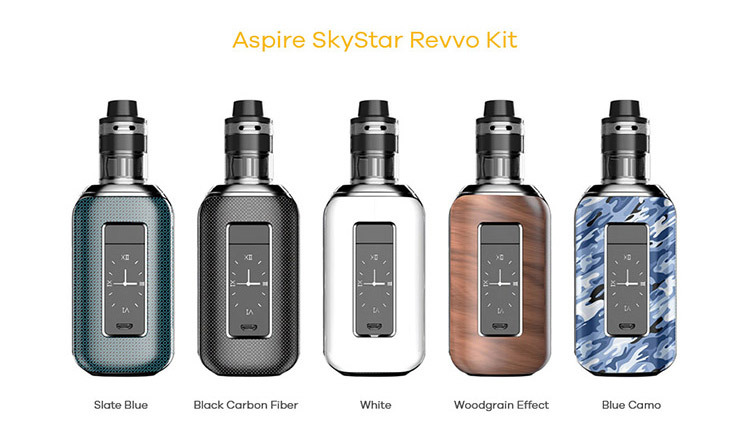 Besides, the Aspire Revvo Tank features the ultra convenient top fill system and innovative ARC (Aspire Radial Coil) technology that easy to refill and will bring the innovative taste feeling. reliable seller... item has reached around 10 working days.. everything is great..